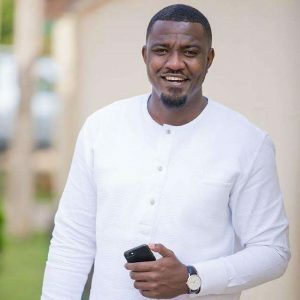 Ghanaian actor and farmer, John Dumelo has advised Ghanaian youths to venture into farming judging from its high returns. According to John Dumelo, his few years of venturing into farming has yielded profits and therefore expect Ghanaian youths to fully engage in farming. He added that farming pays a lot but people have not given it a second thought especially the youths. John Dumelo said this at the National Buffer stock programme to feed free SHS students held at the premises of Accra Girls Senior High School. “At the end of the day, we have to eat what we grow. And we also have to support local consumption. And that’s the thing I am concentrating on. We should encourage the youth to get into farming. Farming is patience but there is a lot of money in farming. If you look at goat meat for example, in Ghana, every single day, you have about 500 or 600 goats being killed. John Dumelo continued by saying, “Currently, I’m into maize farming. I’m into snail farming. I’m into watermelon and pepper. So I want to deal with the kind of level where people would be able to come and buy from us. I mean it’s sad when you look at certain things in the country when you have people importing pork meat, chicken, so many of these things that we can produce in Ghana and it’s bad”. John Dumelo concluded that he can now boast of a three-acre cassava farm in the Manya Krobo community in the Eastern Region and has plans of expanding t0 10 acres very soon.